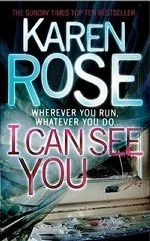 Аннотация к книге "I Can See You"
In Karen Rose`s brilliant new thriller a killer is targeting the participants of an online role playing game called Shadowland. Each of the victims is be-friended by the killer online. He then stalks them in real life, murdering them in the way that they worst fear. Eve Wilson, who we previously met in NOTHING TO FEAR, is researching the game as part of her thesis on how self-esteem is affected by violence. Now she must work with Detective Noah Webster to find the murderer before the killings escalate out of all control and Eve herself becomes a target.